In the popular imagination, I think it's fair to say that Broadway is the quintessential NYC street but most people are unfamiliar with this history of this thoroughfare. 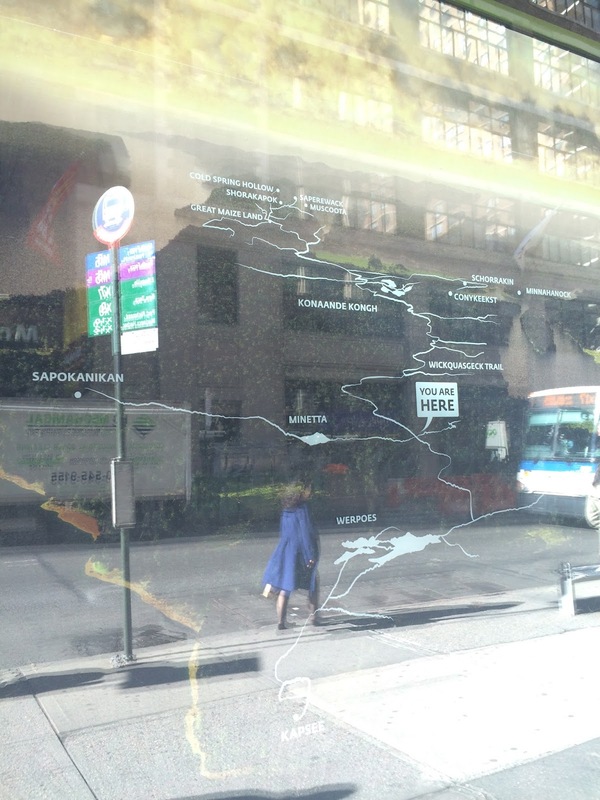 Broadway, according to The Wayfinding Project at the Asian/Pacific/American Institute at NYU, "runs along a portion of the original matrix of trails that connected Manaháhtaan to the broader northeast region and the Great Lakes". Manaháhtaan is the original name given to the island by the Lenape peoples. The Wayfinding Project, a collaboration between John Kuo Wei Tchen, the Asian/Pacific/American Institute at NYU, and artist Beatrice Glow, examines Lenape knowledge of Manhattan and the complex ways in which such knowledge was produced. As part of the larger project, Beatrice Glow developed Lenapeway to celebrate Lenape culture including modes of terrestrial, riverine, and coastal transportation. For example, images of mùxulhemënshi (tuliptree, Liriodendron tulipifera) are projected in the installation; dugout canoes were constructed out of tulip tree wood. 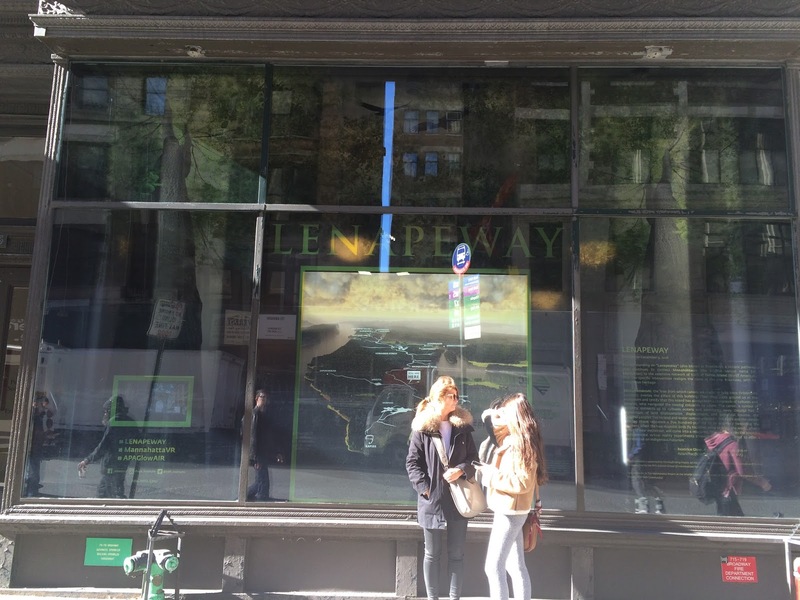 There is a virtual reality component to Lenapeway but the feature I was most interested in exploring was the walking tour of native plant gardens in the area. The actual location of the Lenapeway installation is 715 Broadway which "marks the intersection of the main Lenape trail and a side-trail that traverses through present-day Washington Square Park". I did not participate in the live tour of the garden held on October 18th but I followed Beatrice Glow's map. 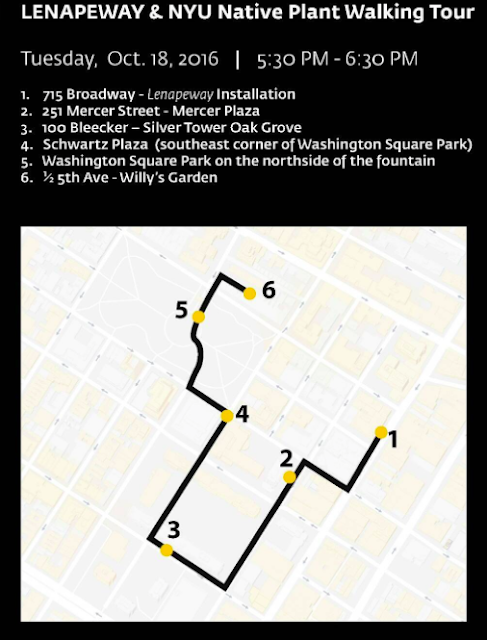 I was comfortable with a self-guided experience because all of the five greenspaces are familiar to me. I wish the map was annotated; it would be informative to know why these particular spaces and which plants are of interest. The open spaces on the map are NYU owned gardens with the exception of Washington Square Park which is a NYC public park. In 2010, I wrote about the renovation of Mercer Plaza. The trees and other plants have filled out significantly. 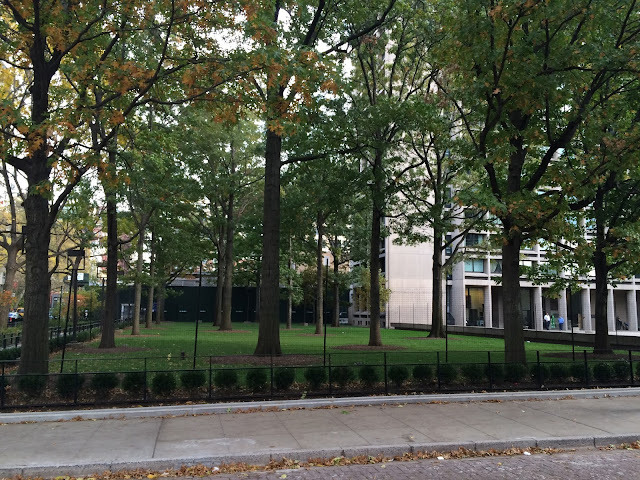 The plaza can be described as verdant. There are a couple of statuesque tulip trees in this garden. Sweetgum and willow oaks also fill out the canopy layer. The sub-canopy and lower layers are planted with native small trees, shrubs, perennials, and grasses. 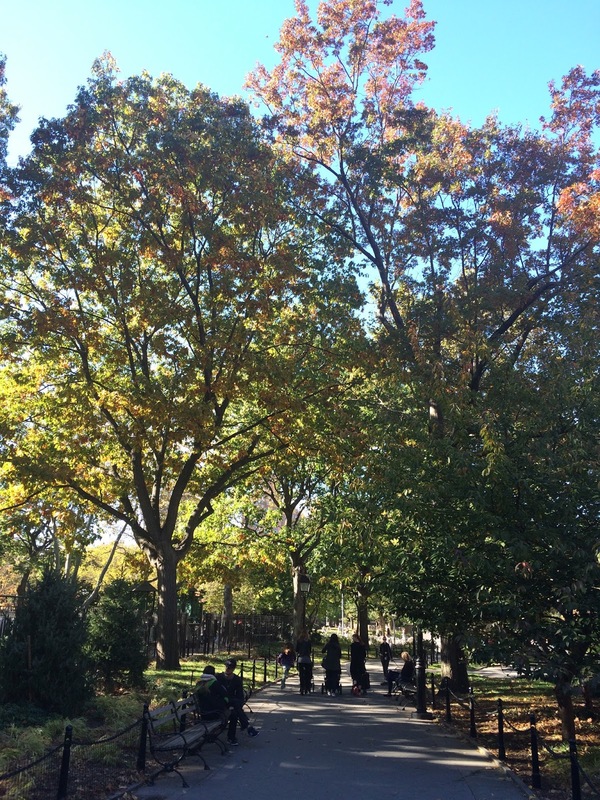 I have written about the oak grove on Bleecker Street here and here. In the latter post, the grove was one of seven Greenwich Village "hidden gems" in and around the NYU superblocks. There are 14 oaks growing in the grove most of which are willow oaks (Quercus phellos). Northern red oak, pin oak, and a young swamp white oak round out the mix. 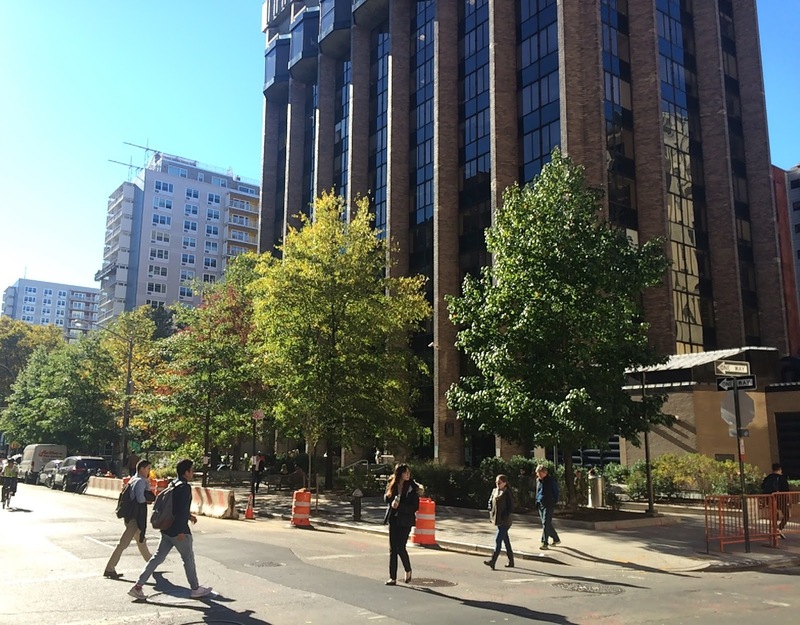 The plaza runs between West 4th and West 3rd Streets. 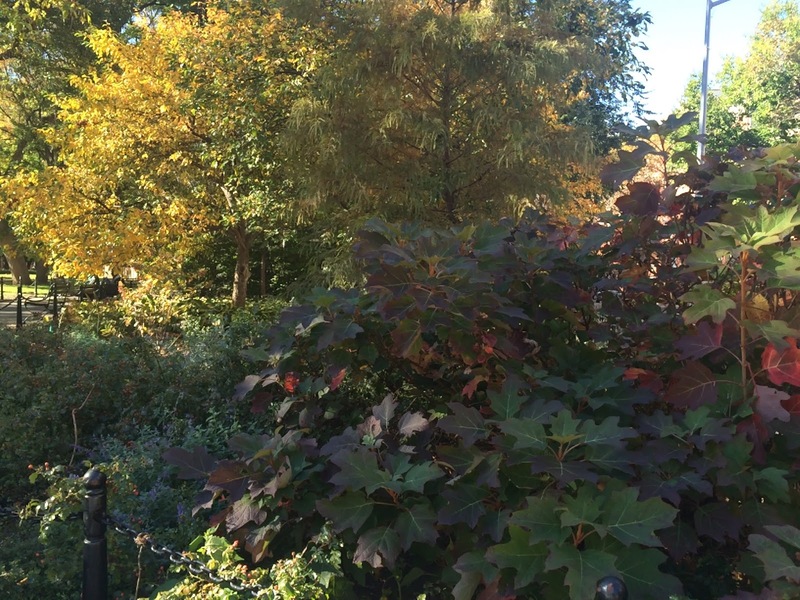 Two garden areas bookend the space and are collectively known as the NYU Native Woodland Garden in Schwartz Plaza. The northernmost of the gardens was once planted with littleleaf lindens with a fern and wild ginger understory. 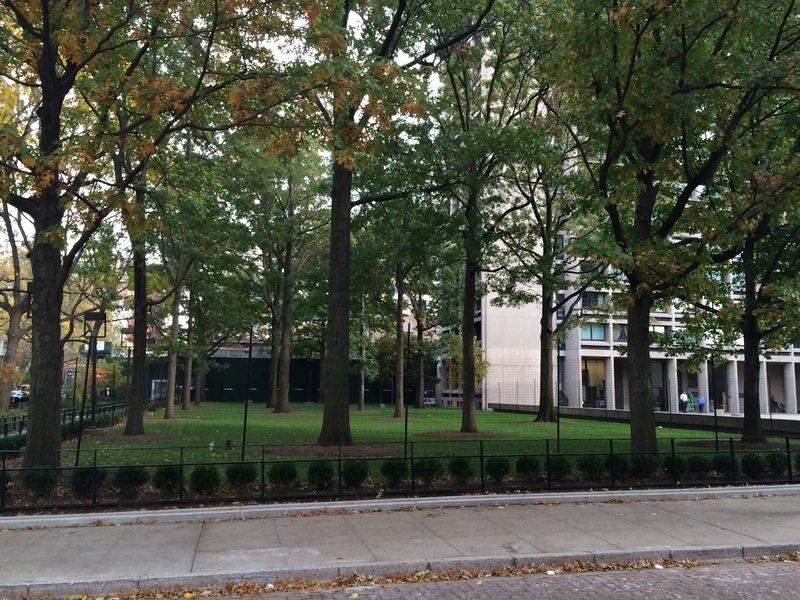 In 2011, the lindens were removed and replaced with American hornbeam (Carpinus caroliana). You can read my report and see a 2009-2013 photo series. The northside of the park was indicated on the map as a site of native plants. Two of my favorite stretches on this edge of the park is the row of oaks east of the Washington Arch. I also like the layered planting zone northwest of the arch. It is planted with, among species, crabapples, oak leaf hydrangeas, and sage. 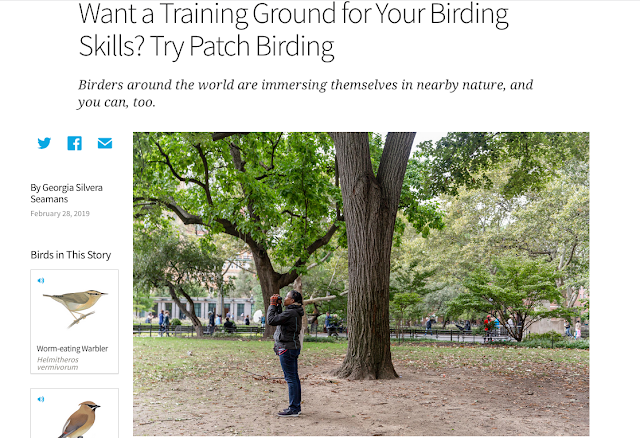 We have noticed during our wildlife survey walks that the latter zone is a hotspot for birds. The walking tour ends at Willy's Garden on Fifth Avenue. The garden is a narrow ground of trees, shrubs, and ground cover. At the rear of the garden is a statue of Miguel de Cervantes, the author of Don Quixote de la Mancha. This statue was given to New York by Enrique Tierno Galván, the Mayor of Madrid, in 1986. 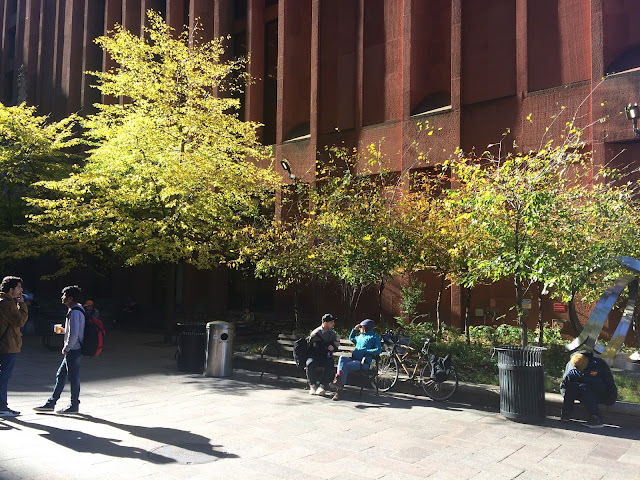 It was placed temporarily in Bryant Park, then slated to be installed in Washington Square Park, but found a permanent home in this New York University courtyard. 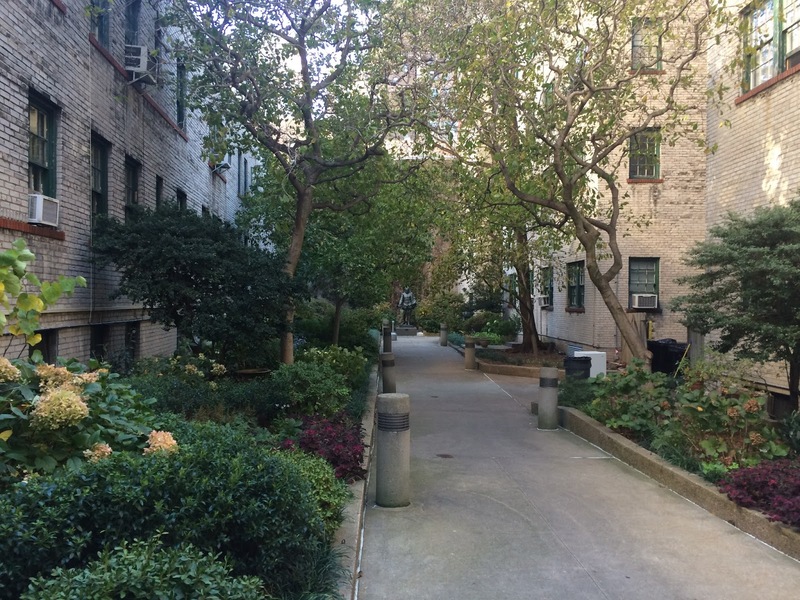 These contemporary gardens are within the historic Minetta Creek watershed (refer to the second photo). The creek ran through what is now Washington Square Park but is now culverted and buried. I would like to see gardens on the former route of the creek that reflect plant communities that would have thrived creekside though this concept would require creative irrigation schemes. Another option would be neighborhood greenspaces vegetated with plants that would have been found in Lenape gardens. There is such a garden in New York City. In 2009, Fritz Haeg of gardenlab/Edible Estates with the Hudson Guild, New York Restoration Project, and Friends of the High Line installed a Lenape Edible Estate at the Elliott-Chelsea Houses. The garden was planted in zones: woodland, flowering meow, berry patch, and Three Sisters. The plant list for each zone is only a subset of the species collected and collected by the Lenape peoples. Maybe the call to action for myself is to contact The Wayfinding Project about designing a garden!